This is part of a series examining the mental health experience in Canada's workplaces.Take part in our short survey (tgam.ca/menthalhealthsurvey) and add your voice to this important conversation. This series supports The Globe and Mail and Morneau Shepell's Employee Recommended Workplace Award, which honours companies that put the health and well-being of their employees first. Winners for 2017 will be announced at a conference in late spring. Sign up to receive an e-mail about registration for 2018 at www.employeerecommended.com. The term mental health problem or illness can be confused with the concept of mental health; however, they are different. About one in five Canadians will experience a diagnosable mental health problem or illness in any given year, whereas everyone has a responsibility to look after their mental health. Good mental health is an important tool to deal with life's daily stresses. The Public Health Agency of Canada defines positive mental health as "the capacity of each and all of us to feel, think, act in ways that enhance our ability to enjoy life and deal with the challenges we face." Given that two-thirds of Canadian adults spend 60 per cent of their time at work, workplaces can have an impact on our mental health. The way you experience your job can either damage, or enrich, your mental health. Consider that a person living with anxiety might be receiving appropriate treatments, have a support network and a fulfilling job, at which she excels. Though she lives with a mental illness, her life circumstances, including her work, enrich her mental health. On the other hand, someone who doesn't have a diagnosable mental health problem may be experiencing a range of challenges, from coping with aging parents, to financial stress, or undue workplace pressures. Even without a mental illness, this individual may still report poor mental health. 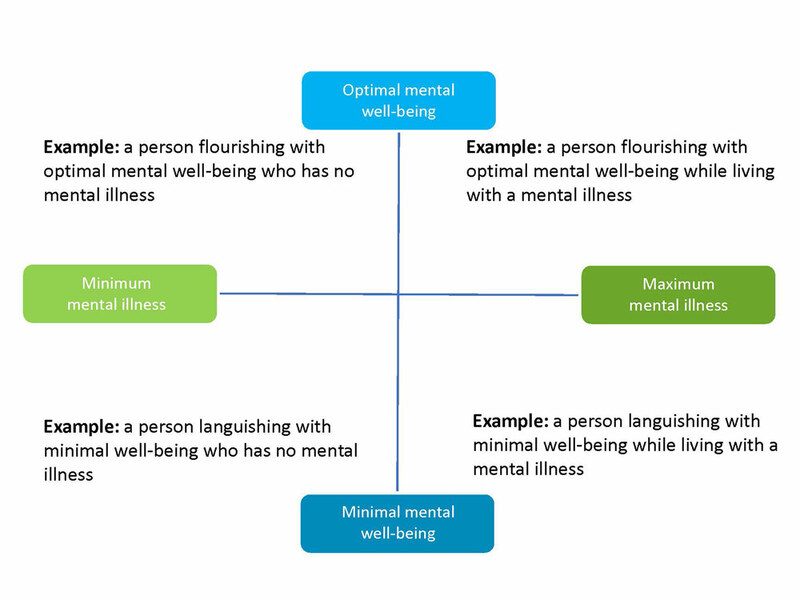 It is helpful to think about positive mental health and mental health problems or illnesses as interconnected, as shown in the diagram below. One axis shows positive mental health as a resource. It is something everyone can work to strengthen. Taking care of your mental health requires the same kind of effort you expend to look after your physical well-being. On the other hand, if you are vulnerable to a mental health problem or illness, you can draw on positive mental health resources and supports to achieve well-being. Given the central role of workplaces, it's not surprising everyone performs better in psychologically healthy settings, free of harassment and bullying, where management is supportive, workloads are reasonable and expectations are clear. While public discussion about mental health is increasing, too often people under stress believe they should be able to cope better. This is often true whether you are living with a diagnosable mental health problem or simply experiencing poor mental health. This kind of thinking can stand in the way of taking positive steps to build up mental health, like seeking appropriate support. Staying in the stress cycle increases the risk of becoming more ill or further depleting mental health resources. When you find yourself feeling overwhelmed, or when your coping skills seem inadequate, reach out to someone you trust. One way to take charge of your mental health is to tune-in to changes in your behaviour, feelings and thoughts. If your personal care, sleeping or eating patterns are changing, or you are being troubled by unwanted feelings and thoughts, these can be warning signals that your mental health needs attention. 1. Make a commitment to learn. Explore what positive mental health means, and what kinds of things can build up your mental health resource kit. The wrong time to prepare for crisis is when you're in it. Find out more about early warning signs and symptoms of mental health problems, and the kinds of help available. Like preventing a heart attack, it's helpful to understand not only the signs and symptoms but also how to engage in prevention, and when and where to reach out when things are getting out of hand. A Mental Health First Aid course could be a good way to start. Consider inquiring if your employer would host one. If you're questioning how well you're coping at work, your current stress level, overall health and workplace experiences, complete the Your Life at Work survey. This behaviour-based tool will help you explore the relationship between stress and health and the role of coping skills. The Working Mind is an excellent tool to help employees learn to address mental health problems with a common language. Many employers in Canada are beginning to offer this training to their workers. Maintaining your mental health is a lot like staying physically fit. A little effort every day goes a long way. The Canadian Mental Health Association is a good place to start for ideas. Many people with mental health problems or illnesses endure in silence. There are resources in your community to help, including your family doctor and your company's employee and family assistance program representative. A new report, released recently by the Mental Health Commission of Canada, Strengthening the Case for Investing in Mental Health: Economic Considerations, highlights Canadian research that indicates a person on short-term disability for a mental health concern will return to work 16 days earlier if they have access to collaborative care – which is when experts from different specialties, disciplines, or sectors work together to offer cohesive client services. This is one of many effective tools, interventions and that are available. Taking action will benefit your health, career and relationships. Have you dealt with or are you dealing with a mental health issue? Please take a moment to complete our survey: The Mental Health Experience in Canada's Workplaces: What's Your Experience? Bill Howatt is the Chief Research and Development Officer of Workforce Productivity with Morneau Shepell in Toronto. Louise Bradley is CEO and President of the Mental Health Commission of Canada.